Botanists from Trinity College Dublin have provided surprising evidence to show that preventing hungry deer from munching on plants actually decreases floral biodiversity in globally important woodland ecosystems. When large herbivores, such as Red, Sika, and Red-Sika hybrid deer, are excluded from semi-natural oak woodland ecosystems in Ireland, the composition and abundance of forest-floor plants is greatly changed; plant communities become significantly less diverse over time as some species begin to dominate, with Bambi and co no longer a threat. The botanists, from the School of Natural Sciences in Trinity, used an existing network of seven long-term experimental deer ‘exclosures’ to monitor biodiversity changes over time. The sites were located within EU-level protected oak woodlands in the Wicklow Mountains National Park, Co. Wicklow, Killarney National Park, Co. Kerry, and Glenveagh National Park, Co. Donegal, and were surveyed periodically for up to 41 years. The botanists have just published their findings in the international peer-reviewed journal Forest Ecology and Management. Researcher Dr Miles Newman, who is lead author of the journal article, said: “This research indicates that deer grazing, at the correct level, is highly important for the conservation of our native oak woodlands.” Semi-natural woodlands are a globally important relict ecosystem for biodiversity. This is especially the case in Ireland where woodland is the natural vegetation cover, but where this habitat type has been reduced to less than 2% of the overall land cover. These relict woodlands are threatened by a range of human-induced actions and changes, such as land-use and climate change, as well as by deer overgrazing…. The state’s plan to build a pair of 35-mile tunnels under the delta would cause the extinction of winter-run chinook salmon, steep declines in dozens of other species and devastate water quality in San Francisco Bay, an environmental group said Wednesday. – Today, The Bay Institute released a comprehensive review of the draft Bay Delta Conservation Plan (BDCP) and its associated environmental documentation (draft Environmental Impact Statement and Environmental Impact Report). BDCP is a proposed Habitat Conservation Plan and Natural Community Conservation Plan that is billed as a means of restoring the Delta ecosystem, including its imperiled salmon, steelhead, and sturgeon populations, while also improving the reliability of water supplies for the water agencies in the San Joaquin Valley and southern California that export water through the giant state and federal water project pumps in the south Delta. A key feature of the BDCP is a proposal to construct two extremely large tunnels under the Delta that would convey water from the Sacramento River directly to existing export pumping facilities…..
Winter-run Chinook salmon will probably be driven to extinction by operations of the new water diversion facility proposed by the BDCP. Planned operations would also lead to poor spawning and rearing conditions for this species in its only known spawning locations, downstream of Shasta Dam. Major negative impacts to spring-run, late-fall run, and the commercially valuable fall-run of Chinook salmon would occur in the Delta, particularly downstream of the proposed new water diversion facility, and upstream. Both green and white sturgeon species would be exposed to dramatically degraded conditions, upstream, in the Delta, and in San Francisco Bay. Water quality in the Delta would decline as a result of the BDCP, affecting local Delta farms and key rearing habitats for ducks, geese, and myriad shorebird species. Impacts to San Francisco Bay from reduced Delta outflows and diminished productivity of key estuarine habitats were largely unanalyzed by the Plan and its draft EIS/EIR, and are likely to be significant. A new study could greatly improve current methods of localizing birdsong data. The study demonstrates the validity of using approximate maximum likelihood (AML) algorithms to determine the direction of arrival (DOA) of birdsong sources. Researchers have observed a deep-sea octopus brooding its eggs for four-and-a-half years — longer than any other known animal. Throughout this time, the female kept the eggs clean and guarded them from predators. How can we best come to terms with the exotic species that surround us? What should be done with the wattle-necked softshell turtles on the Hawaiian island of Kauai? The turtles came from China, starting in the 1850s, brought by sugarcane farmers who liked them as soup. Today, they’re endangered in China and considered invasive—the term for non-native species that cause undesirable effects—in Kauai. But conservationists don’t believe the animals are safe from hunting in their home range, so there’s little point in boxing them up and sending them back. It’s a head scratcher: Should we remove the turtles from Kauai to preserve the native ecosystem there—the turtles could potentially eat native fish—and risk the extinction of their species, or should we keep them alive in Hawaii? Those kinds of knotty questions are becoming more commonplace in ecology, as global change accelerates. And so a new attitude is emerging that’s less reflexively hostile toward invaders. It was much in evidence at a symposium held last week at the North American Congress for Conservation Biology in Missoula, Montana. I participated as a journalist but not a disinterested observer: I’ve argued in the past that it’s time for a more nuanced approach to the non-native plants and animals among us……Julian Olden, a biologist at the University of Washington, Seattle, who co-organized the symposium, recently polled nearly 2,000 ecologists. Among his findings: A substantial number of them said they would immediately eradicate a hypothetical non-native forest plant, even if it were shown to have no effect on the forest. Olden calls this the “guilty even when proven innocent” approach. That kind of approach is not very useful on a rapidly changing planet. Climate change is making it harder even to decide who the invaders are. How, scientists at the symposium wondered, do you define “native” on a warming planet, when plants and animals are already moving toward the poles or up mountainsides in search of climate conditions they can tolerate? Should we consider them “invasive” in their new homes? Regardless of what we label them, conservationists will be reluctant to remove them from their new environs—to do so would stymie their chances of adapting to the warmer future we’re creating. And then there are the non-natives that we actually like. Most domestic crops are exotic in most of the places they’re grown, but there are even wild exotics that “do good,” forming useful relationships with native species. Invertebrate numbers have decreased by 45 percent on average over a 35 year period in which the human population doubled, reports a study on the impact of humans on declining animal numbers. This decline matters because of the enormous benefits invertebrates such as insects, spiders, crustaceans, slugs and worms bring to our day-to-day lives, including pollination and pest control for crops, decomposition for nutrient cycling, water filtration and human health. Old and used electric waste (stock image). Nearly a quarter of the waste from developed nations went to China, India and five West African countries: Nigeria, Ghana, Ivory Coast, Benin and Liberia. As local and national governments struggle to deal with ever-growing piles of electronic waste, scientists are now refining the picture of just how much there is and where it really ends up. Their study found that nearly a quarter of e-waste that developed countries discard floods into just seven developing countries — with major potential health risks for the people who live there…. (a) Down – in the water – they sometimes like to swim in lakes, or slow-moving rivers and streams. (b) Under the hoods of automobiles that have just been run – for the heat of the engine. (c) Up – they can sometimes be found lounging in trees. (d) Behind – rocks, that is – they like to blend into gray fields of boulders. (e) In flocks of sheep, where they like to pretend they are wolves. Eight of the top 10 U.S. cities that have seen an increase in so-called “nuisance flooding”–which causes such public inconveniences as frequent road closures, overwhelmed storm drains and compromised infrastructure–are on the East Coast, according to a new NOAA technical report. This nuisance flooding, caused by rising sea levels, has increased on all three U.S. coasts, between 300 and 925 percent since the 1960s. The report, Sea Level Rise and Nuisance Flood Frequency Changes around the United States, also finds Annapolis and Baltimore, Maryland, lead the list with an increase in number of flood days of more than 920 percent since 1960. Port Isabel, Texas, along the Gulf coast, showed an increase of 547 percent, and nuisance flood days in San Francisco, California increased 364 percent…. The extent of sea ice covering the Arctic Ocean at the end of the summer season likely won’t surpass the record low of 2012, but 2014 will still likely rank as one of the lowest minimum extents (or areas) in the record books. The map above shows the predicted global warming impact of all anthropogenic emissions, including biomass burning, on global near-surface air temperature since 1850. The map below shows the observed change in global near-surface air temperature since 1900. The average modeled increase in temperature since 1850 is 1.0 K. The average observed increase since 1900 is 0.92 K. Most increases in temperature occur over the Arctic, which is melting quickly. July 31, 2014 — Research demonstrates that it isn’t just the carbon dioxide from biomass burning that’s the problem. Black carbon and brown carbon maximize the thermal impacts of such fires. They essentially allow biomass burning to cause much more global warming per unit weight than other human-associated carbon sources…. Jacobson explains that total anthropogenic, or human-created, carbon dioxide emissions, excluding biomass burning, now stand at more than 39 billion tons annually. That incorporates everything associated with non-biomass-burning human activity, from coal-fired power plants to automobile emissions, from concrete factories to cattle feedlots. Jacobson, the director of Stanford’s Atmosphere/Energy Program and a senior fellow at the Woods Institute for the Environment and the Precourt Institute for Energy, said almost 8.5 billion tons of atmospheric carbon dioxide — or about 18 percent of all anthropogenic carbon dioxide emissions -comes from biomass burning. But Jacobson’s research also demonstrates that it isn’t just the CO2 from biomass burning that’s the problem. Black carbon and brown carbon maximize the thermal impacts of such fires. They essentially allow biomass burning to cause much more global warming per unit weight than other human-associated carbon sources. Black and brown carbon particles increase atmospheric warming in three ways. First, they enter the minuscule water droplets that form clouds. At night, that’s not an issue. But during the day, sunlight scatters around within clouds, bathing them in luminescence. When sunlight penetrates a water droplet containing black or brown carbon particles, Jacobson said, the carbon absorbs the light energy, creating heat and accelerating evaporation of the droplet. Carbon particles floating around in the spaces between the droplets also absorb scattered sunlight, converting it to heat. “Heating the cloud reduces the relative humidity in the cloud,” Jacobson said. This causes the cloud to dissipate. And because clouds reflect sunlight, cloud dissipation causes more sunlight to transfer to the ground and seas, ultimately resulting in warmer ground and air temperatures. Jacobson noted that some carbon particles — specifically white and gray carbon, the variants associated with some types of ash — can exert a cooling effect because they reflect sunlight. That must be weighed against the warming qualities of the black and brown carbon particles and CO2 emissions generated by biomass combustion to derive a net effect. Jacobson said the sum of warming caused by all anthropogenic greenhouse gases — CO2, methane, nitrous oxide, chlorofluorocarbons and some others — plus the warming caused by black and brown carbon will yield a planetary warming effect of 2 degrees Celsius over the 20-year period simulated by the computer. But light-colored particles — white and gray particles primarily — reflect sunlight and enhance cloudiness, causing more light to reflect. “The cooling effect of these light-colored particles amounts to slightly more than 1 C,” Jacobson said, “so you end up with a total net warming gain of 0.9 C or so. Of that net gain, we’ve calculated that biomass burning accounts for about 0.4 C.”…. Researchers show how they’ve used advanced computational data science tools to demonstrate that despite global warming, we may still experience severe cold snaps due to increasing variability in temperature extremes. .. What they found may surprise some: While global temperature is indeed increasing, so too is the variability in temperature extremes. For instance, while each year’s average hottest and coldest temperatures will likely rise, those averages will also tend to fall within a wider range of potential high and low temperate extremes than are currently being observed. This means that even as overall temperatures rise, we may still continue to experience extreme cold snaps, said Kodra, who earned the College of Engineering’s outstanding graduate research award in 2014 and is now leading data analytics efforts at Energy Points, an innovative Boston area startup. That is an important point in the ongoing effort to accurately inform the public about climate change. “Just because you have a year that’s colder than the usual over the last decade isn’t a rejection of the global warming hypothesis,” Kodra explained… The research also opens new areas of interest for future work, both in climate and data science. It suggests that the natural processes that drive weather anomalies today could continue to do so in a warming future. For instance, the team speculates that ice melt in hotter years may cause colder subsequent winters, but these hypotheses can only be confirmed in physics-​​based studies. The study used simulations from the most recent climate models developed by groups around the world for the Intergovernmental Panel on Climate Change and “reanalysis data sets,” which are generated by blending the best available weather observations with numerical weather models. The team combined a suite of methods in a relatively new way to characterize extremes and explain how their variability is influenced by things like the seasons, geographical region, and the land-​​sea interface. The analysis of multiple climate model runs and reanalysis data sets was necessary to account for uncertainties in the physics and model imperfections. Southern California’s coast rarely sees lightning storms, because the weather is so stable. Could drought be destabilizing things? Sunday’s deadly, freak storm shows what the Golden State may face. A rare deadly lightning storm Sunday over Southern California’s Venice Beach raises questions about whether the drought-ravaged state faces new weather risks due to its changing climate. A changing climate may alter Southern California’s weather patterns, making such “freak” occurrences more common. The famed Los Angeles seaside community rarely sees lightning storms, but beachgoers rushed for cover when a thunderstorm struck at about 2:30 p.m. Four direct lightning strikes were reported, and bathers reported feeling their hair standing on end. A 20-year-old Los Angeles man was pulled from the water unconscious and later pronounced dead. The same storm swept over Santa Catalina Island off Los Angeles about 90 minutes earlier, with lightning injuring a 57-year-old golfer and igniting two brush fires. Summer is the dry season in California, with any rain at all unlikely in July. Lightning is extremely unusual on the Southern California coast at any time because the weather is so heavily influenced by the ocean, which tends to stabilize the air, said Kevin Trenberth, senior scientist in climate analysis at the National Center for Atmospheric Research. It takes the meeting of warm, humid layers of air with colder, sometimes icy air to produce the build-up of electrical charges that lead to lightning. Lightning occurs somewhere on Earth (or in the clouds) about 45 times per second, making it one of the most common extreme weather events. It is also one of the most deadly, with thousands killed by lightning strikes each year. Scientists are studying the connection between climate change and the potential for increased lightning, but they have not arrived at any clear conclusions. But Richard Blakeslee, a lightning expert with NASA’s Airborne Science Program, says that the space agency has not detected any change in lightning patterns in the United States that could be associated with climate change. The tools for such research will soon be improving. NASA’s next geostationary satellite, GOES-R, scheduled to launch in early 2016, will have a sophisticated new lightning mapping instrument aboard. “We will be able to collect more data on lightning in the first two weeks than we’ve been able to gather in the whole 17 years of satellite monitoring of lightning,” Blakeslee said. One of the primary aims is to develop better forecasting, crucial to avoiding lightning deaths and injuries. Since 1977, the Southern Alps’ ice volume has shrunk by 18.4 km3 or 34%, and those ice losses have been accelerating rapidly in the past 15 years. The story of the Southern Alps’s disappearing ice has been very dramatic – and when lined up with rapid glacier retreats in many parts of the world, raises serious questions about future sea level rise and coastal climate impacts….. Courtesy Woods Hole Oceanographic Institution; A freeze frame from an animation created by Sarah Cooley, Woods Hole Oceanographic Institution, shows predicted surface ocean pH levels. On Monday, Congressman Jared Huffman met with scientists, fishermen and business owners in Bodega Bay to discuss a looming threat to marine ecosystems in Northern California and around the world: ocean acidification. It’s caused by increasing levels of carbon dioxide in Earth’s atmosphere. The health of the oceans was also the focus of an international conference at the U.S. State Department this week. We’ll examine the problem and talk about President Obama’s plan, announced on Tuesday, to use his executive authority to create the world’s largest marine sanctuary in the south-central Pacific Ocean. A report from the National Wildlife Federation last year outlined the multitude of risks that birds are facing from climate change, including mismatches in migration time, food, and resources at their migration destination. This mismatch can be caused by earlier-than-usual springs, or springtime weather that gets warm and then dips down into low temperatures again. Many species of migratory birds depend on triggers such as changes in day length to know when to migrate, but if spring starts earlier in their migration destination region, they may arrive to find that they’ve missed the bud burst or insect hatching that they need to sustain themselves…. For the second year in a row, flames in Yosemite National Park are turning up the heat on California’s wildfire season, fueled by one of the most severe droughts in decades. But despite dangerously dry conditions, tens of thousands of lightning strikes and a remarkably early start, aggressive firefighting has helped keep this year’s fire season surprisingly mild — so far. As of Sunday, a total of 51,903 acres have burned in California this year, slightly below the 60,379 five-year average for this time of year, according to totals from the U.S. Forest Service and Cal Fire….. Many studies have shown the potential for global climate change to cut food supplies. But these studies have, for the most part, ignored the interactions between increasing temperature and air pollution — specifically ozone pollution, which is known to damage crops. A new study shows that these interactions can be quite significant, suggesting that policymakers need to take both warming and air pollution into account in addressing food security. New maps released Tuesday illustrate the toll climate change and pollution are taking on several communities in Los Angeles, many of the same areas that also hold the greatest potential for clean energy investment. The Los Angeles Solar and Efficiency Report (LASER) is the result of a partnership between the Environmental Defense Fund and UCLA Luskin Center for Innovation. The groups say their work is a prime example of how big data can be used to engage citizens in the challenges and opportunities associated with climate change right in their own neighborhoods. While climate change will drive up temperatures in Los Angeles, a particular concern for at-risk communities already burdened by pollution, the analysis found major potential for solar and energy efficiency projects. Realizing just ten percent of the city’s untapped rooftop solar potential, for instance, would create 47,000 solar installation jobs and could reduce carbon pollution by nearly 2.5 million tons annually — the equivalent of taking more than half a million cars off the road every year…. More than half of California is now under the most severe level of drought for the first time since the federal government began issuing regular drought reports in the late 1990s, according to new data released Thursday. According to the U.S. Drought Monitor report, in July roughly 58% of California was considered to be experiencing an “exceptional” drought — the harshest on a five-level scale. This is the first year that any part of California has seen that level of drought, let alone more than half of it, said Mark Svoboda, a climatologist with the National Drought Mitigation Center, which issued the report. “You keep beating the record, which are still all from this year,” he said. The entire state has been in severe drought since May, but more of it has since fallen into more severe categories — “extreme” and “exceptional.” Nearly 22% more of California was added into the exceptional drought category in the last week alone…. Droughts historically have a way of sneaking up on California, and the extraordinary 2012-2014 drought has been no exception. Year-to-year and even season-to-season rainfall variability is quite high in this part of the world, which means that it’s nearly impossible to know whether a single dry year (or season) portends the beginning of a much more prolonged or intense dry period. Indeed–the 2012-2013 rainy season had an extremely wet start–so wet, in fact, that an additional large storm during December 2012 would likely have led to serious and widespread flooding throughout Northern California. But no additional significant storms did occur during December 2012–nor during January 2013…nor February, March, April, or May. 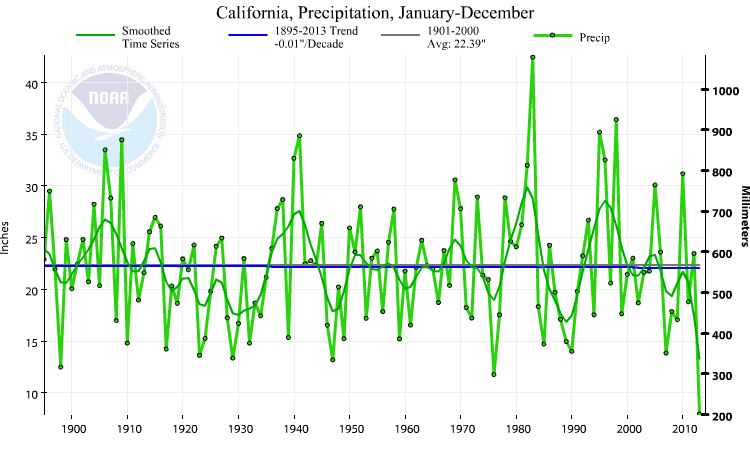 In fact, January-June 2013 was the driest start to the calendar year on record for the state of California in at least 118 years of record keeping. Some parts of the state saw virtually no precipitation at all during this period, which made for an especially stark contrast with the extremely wet conditions experienced just a few months earlier…. Add another casualty to California’s prolonged and punishing drought: Wildlife officials warned this week that dry conditions in the state’s Central Valley could have a devastating effect on North American waterfowl. The Central Valley is recognized as the most important resting and wintering ground on the Pacific Flyway, a global migratory path for millions of ducks, geese and other birds. About 5 million waterfowl spend the winter on state and federal wildlife refuge areas and flooded rice fields in the Central Valley each winter. This year, the worst drought in a generation means those Central Valley habitats have been dramatically reduced in size. Wildlife refuges have had their state and federal water supplies cut by 25 percent. Rice acreage has been reduced by a similar amount as farmers also have endured water cutbacks. As a result, millions of migrating birds will be crowded into less habitat, significantly increasing the odds of botulism outbreaks, which spread rapidly and can kill thousands of birds in a matter of days. The problem is not limited to rural areas but can affect waterfowl drawn to urban water bodies as well. Officials also are concerned the drought could cause food shortages. Already, at least 1,700 waterfowl have died at Tule Lake National Wildlife Refuge near the Oregon border. Between 10 and 20 ducks were found dead Tuesday in a canal that flows through Sacramento’s Pocket neighborhood, near Portuguese Community Park. A similar number of birds were found dead recently in a city pond in Hesperia in San Bernardino County. Avian botulism is suspected in each case, though laboratory verification is pending…. As you watch the miles roll by on family road trips this summer, look just behind the guard rails to see what some scientists believe is a significant untapped resource in the battle against climate change. The land alongside the 4 million miles of U.S. public roadways, already being maintained by federal, state, and local governments, could be planted with vegetation that helps transfer carbon from the atmosphere into the soil, they say. Road banks and berms, in other words, could be managed as valuable “banks” for carbon sequestration….Shrubs, grasses, and other plants already along roads in U.S. National Parks, wildlife refuges, and other public lands currently are capturing about 7 million metric tons of carbon each year, Ament said in a report on his findings at this month’s North American Congress for Conservation Biology in Missoula. That’s equivalent to the annual carbon emissions of 5 million cars—without any effort made to optimize the mix of plantings and soil management practices for carbon storage. Add to that the strips of shrubbery and grass along U.S. highways outside federal lands. A previous study by the Federal Highway Administration concluded such roadside greenery stores enough carbon to counter the annual emissions of 2.6 million passenger cars. Together, the roadside soils and vegetation on federal lands and along U.S. highways, comprising 10.5 percent of all public roads in the nation, are already capturing nearly 2 percent of total U.S. transportation carbon emissions, said Ament, whose team conducted the research for the Highway Administration’s federal lands office….New Mexico has a five-year, $1 million grant from the federal Highway Authority to research methods for boosting carbon capture along the 7,500 miles of state road in its semi-arid environment. Testing different plantings and techniques over the past year, the state boosted carbon capture on roadsides to from 35 percent to 350 percent over areas that weren’t actively managed. Native grasses produced the biggest gains, in the state’s prairie regions. There are other benefits. Mowing less frequently – letting grass grow 8 inches instead of the normal 6 inches – saves fuel, labor and stores more carbon. “There’s a win-win to a lot of what we’re doing,” said Rick Wessel, of the New Mexico Department of Transportation’s environmental development section. Another benefit: New Mexico and other states might be able to earn revenue from sale of carbon credits for taking such steps…..
During the Bonn session in June, it seemed that Parties became more accepting of the synergies and linkages between mitigation and adaptation. However, identification of the technical details and development of modalities concerning the relationships between mitigation and adaptation has not yet been considered within the UNFCCC. Many Parties have mentioned that such information would be useful. Recognition of the links between adaptation and mitigation has been argued for inclusion in the Paris Agreement and it can be expected that the discussion will be ongoing into the October ADP inter-sessional (ADP 2-6) and COP20 in Lima. …. Recognition of the links between adaptation and mitigation has been argued for inclusion in the Paris Agreement and it can be expected that the discussion will be ongoing into the October ADP inter-sessional (ADP 2-6) and COP 20. Further, the non-paper released by the ADP Chairs following the session identifies Party positions on the linkages, such as defining the relationships between mitigation, adaptation and loss and damage as well as potential for institutional linkages between the two as mutually supportive notions. The Co Chairs of the ADP have also now issued a new reflections note on progress, a draft decision on pre-2020 ambition and a draft decision on INDCs to assist Parties between now and the next ADP intercessional in October. Several Parties mentioned that a failure in Lima will guarantee a failure in Paris. As things move forward, all Parties will need to consider whether another major climate summit failure is something that the world can afford. LATEST crop-simulation modeling and analyses showed that temperature increase is likely to result in rice-yield reduction, a joint statement by the International Rice Research Institute (IRRI) and the Southeast Asian Regional Center for Graduate Study and Research in Agriculture (Searca) said on Wednesday. “Global warming is likely to lead to drier conditions, which will result to a decrease in area planted, hence, affecting rice overall production in the Philippines,” according to the study titled “Impact on Climate Change on the Philippine Rice Sector: Supply/Demand Projections and Policy.” The study, a collaboration between Searca and the IRRI, concludes the impact of climate change on rice farming in the Philippines, explaining that crop yields were estimated and compared for different possible climate scenarios, which included incremental increases in temperature change in rainfall volume and distribution, and increase in atmospheric carbon dioxide concentration. Adaptive measures, however, were in place and is already showing positive reports, the study said….Included in the good practices surveyed were adjusting the crop calendar, updating of weather-based dynamic cropping calendar based on crop-yield probabilities, planting more resistant or climate stress-tolerant crop varieties, and employing crop-diversification and crop-livestock integration…. Conservative religious leaders… reasserted their support for President Obama’s environmental policies at public hearings on new E.P.A. pollution rules…. On Wednesday, the fisheries division of the National Oceanic and Atmospheric Administration announced that it’s considering a ban on recreational and commercial fishing of Pacific bluefin tuna. American citizens are increasingly divided over the issue of environmental protection and seem to be taking their cue primarily from Congress, finds new research. The gap between conservatives who oppose environmental protection and liberals who support it has risen drastically in the past 20 years, a trend seen among lawmakers, activists and — as the study indicates — the general public as well, said a sociologist…. If the BLM gives final approval for a plan to authorize sales of 10 billion tons of coal from the Powder River Basin it would lock in massive amounts of carbon pollution for decades to come. A Monterey County Superior Court judge has issued a preliminary ruling that San Benito County unlawfully approved an oil-development project near Pinnacles National Park that could result in hundreds of wells being drilled in important agricultural and wildlife habitat in the Salinas Valley watershed. The recent lawsuit was brought against San Benito County for allowing a project involving 15 exploratory wells operated by Newport Beach-based Citadel Exploration to move forward without an environmental impact report, or EIR. The plaintiff, Center for Biological Diversity, argued that the project would be dangerous to the area’s condor foraging habitat and risk polluting the watershed that drains into the Salinas River. Because of these risks, San Benito County was obligated to conduct an EIR according to the California Environmental, attorneys for the Center for Biological Diversity successfully argued…. A new dye-sensitized solar cell absorbs a broad range of visible and infrared wavelengths. Dye-sensitized solar cells rely on dyes that absorb light to mobilize a current of electrons and are a promising source of clean energy. Scientists have now developed zinc porphyrin dyes that harvest light in both the visible and near-infrared parts of the spectrum. Scientists have synthesized a catalyst that improves their system for converting waste carbon dioxide into syngas, a precursor of gasoline and other energy-rich products, bringing the process closer to commercial viability. Speaker Sara Hutto will discuss the Gulf of the Farallones National Marine Sanctuary’s Climate-Smart Adaptation Project for the North-central California Coast and Ocean which will produce a comprehensive and prioritized adaptation implementation plan. The project has engaged scientists and resource managers to develop vulnerability assessments for focal resources. This information is guiding adaptive management through a working group of local stakeholders. The sanctuary will develop a detailed implementation plan and design pilot living shoreline projects. Click here to register. Click here for details of this CA LCC Project. Playing in schoolyards that feature natural habitats and trees and not just asphalt and recreation equipment reduces children’s stress and inattention, according to a study. July 28 2104 NEW YORK (Reuters) – Ditching handshakes in favor of more informal fist bumps could help cut down on the spread of bacteria and illnesses, according to a study released on Monday. The shape of the moon deviates from a simple sphere in ways that scientists have struggled to explain. A new study shows that most of the moon’s overall shape can be explained by taking into account tidal effects acting early in the moon’s history. Active ingredients in sunscreens come in two forms, mineral and chemical filters. Each uses a different mechanism for protecting skin and maintaining stability in sunlight. Each may pose hazards to human health. The most common sunscreens on the market contain chemical filters. These products typically include a combination of two to six of these active ingredients: oxybenzone, avobenzone, octisalate, octocrylene, homosalate and octinoxate. Mineral sunscreens use zinc oxide and/or titanium dioxide. A handful of products combine zinc oxide with chemical filters…. Daily consumption of beverages sweetened with high-fructose corn syrup or sucrose can impair the ability to learn and remember information, particularly when consumption occurs during adolescence, a study done in rats suggests. Eating tree nuts appears to help reduce two of the five markers for metabolic syndrome, a group of factors that raise the risk for heart disease and other health problems such as diabetes and strokes, a new research paper says. Eating five daily portions of fruit and vegetables is associated with a lower risk of death from any cause, particularly from cardiovascular disease, but beyond five portions appears to have no further effect, finds a new study. ANSWER: (c) “Up – they can sometimes be found lounging in trees.” Common gray foxes have the ability to climb trees to look for food, escape from danger, or simply to lounge around on a favorite branch. They can even jump between branches. RELATED: Rare Daytime Sighting Caught on Ocotillo Wells SVRA Critter Cam!